Over the last year many companies and government organizations beganmigrating from platforms such as UNIX to the Windows 2003 platform tohave a high performance system that is available 24X7. However, theseorganizations face a huge learning curve on how best to set up highperformance Windows Server 2003 networks for maximum availability andpower. This book provides a clear and concise road map on keeping systemsup 24X7 with the Windows platform. 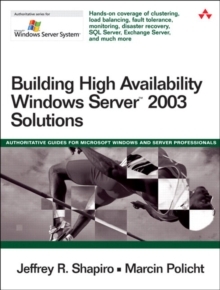 It delves into topics that explain how touse Windows Server 2003 technology for scalability, uptime, performance, andmanagement, and how to avoid getting in trouble at the same time. This bookanswers questions network administrators ask such as, "Should we cluster, loadbalance, or both? Or should we invest in hot standbys? What works best? "After providing answers, Shapiro goes beyond discussing failover and faulttolerance to explaining monitoring, disaster recovery, and choosing the righttechnology to achieve maximum availability and high performance. This is thefirst book that not only provides thorough coverage of core clusterconfiguration and load balancing, but also explains how to maintain andadminister a Windows 2003 high performance system, and restore and recoverfailed servers in the event of a disaster.